Sri Krishna Janmashtami is the most important festival of our temple. The entire world celebrates the divine appearance of Lord Sri Krishna. In our temple, the arrangements for the festival start well ahead. The entire temple is cleaned and painted. Electricians perch themselves at various places to hook up the lights which will dazzle the onlookers. The temple hall is decorated with flowers and festoons. Truckloads of vegetables, grains and fruits arrive at the kitchen. Numerous people are engaged in various culinary activities. One of the specialties of Janmashtami is the offerings made to the Lord. 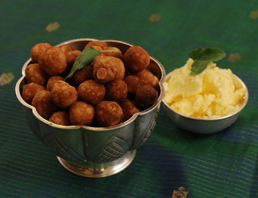 The Supreme Lord Sri Krishna is offered 108 different food items. With great care and attention, devotees prepare these food items to be offered to their beloved Lord. Tons of sweet pongal is prepared for distributing to the visitors who come to the temple on this most auspicious day to have the darshan of their Lord. In another part of the temple, various types of brass lamps used for worship of the Lord are polished to shine like gold. 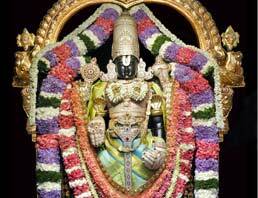 Preparations for the worship of the Supreme Lord include several details. With great reverence, devotees prepare for the ceremonial bathing of the Lord. Kalashas are decorated with artistically wound threads and filled with water. The water is sanctified with items like cloves, cardamom, saffron, tulasi and rose petals. 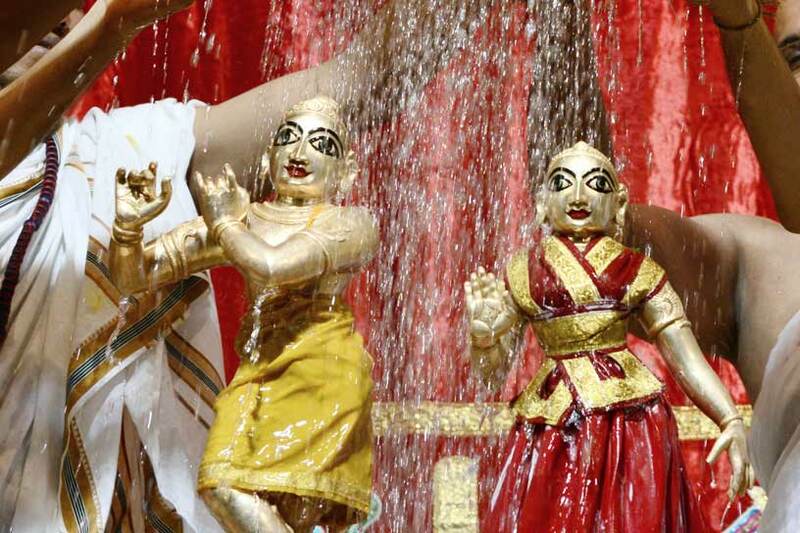 The Supreme Lord is invoked in the water. The kalasha is covered with a coconut on the top. Various arrangements are made to take care of the necessities of the pilgrims who visit the temple on this day and to ensure their security. Thousands of devotees visit the temple on the day of Janmashtami to be a part of the festivities. Days of preparation finally culminates into the grand ceremonial bathing of the Lord at the stroke of midnight. The utsava Deities of Sri Radha Krishnachandra are anointed with fragrant oils and are bathed with auspicious items like milk, yogurt, ghee, honey, sweet water and fresh juices. They are then smeared with turmeric paste and bathed in Ganges water. Varieties of flowers are showered until the Deities are submerged in the soft bed of flowers. LIVE Darshan from Hare Krishna Hill, Bangalore. Download a free guide to observing Janmashtami Vrata at home. Make delicious dishes and offer them to Lord Krishna.